TeamCME is recognized by the PACE program of the Fede ration of Chiropractic Licensing Boards. This TeamCME sponsored OccMed Course was developed, distributed and presented in association with ManageCo, a third party vendor. This is an introduction into Occupational Medicine for DCs. Occupational Medicine is defined as services provided primarily to companies relating to employee working environments for prevention of illness and disease due to exposures such as loud noise, dust/fumes, chemicals, heavy metals, drugs, alcohol, and physical exertional exposures. When compared to CDL physicals for commercial drivers, there are an additional 12+ diagnostic tests that are either government mandated, or utilized by companies to prevent Worker’s Compensation injuries. The list of needed services include physicals, drug testing, alcohol testing, hearing testing, pulmonary lung testing, respirator questionnaire/physical, respirator fit testing, vision testing, heavy metals testing, hand dexterity testing, and more. This course reviews all of these diagnostic tools, certifies attendees in urinary drug test collections, and reviews the government rules and mandates for DOT, OSHA, and NIOSH that allow DCs to participate in providing these services. Because this is not “sick” care, these services are usually paid directly from the company to the doctor. DCs that master these services can be designated as the company examiner to provide occupational services as well as treatment of the company’s Worker’s Compensation injuries. City, county, state, and federal governments also contract occupational services. 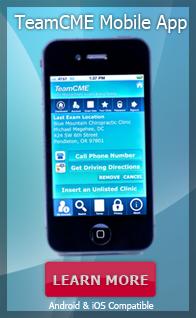 PACE -Up to 16 Hours PACE CE Credits may be available when attendees identify themselves as a “TeamCME” attendee. This course is presented by ManageCo, a third party vendor sponsored by TeamCME. TeamCME is a Federation of Chiropractic Licensing Boards Provider of Approved Continuing Education offering approved continuing education credits in up to 26 States. For additional PACE information and a list of States that accept PACE (Click Here). Prior to attending, please verify with your state licensing board that this course has been accepted for continuing education credit as a PACE provider sponsored third party vendor. 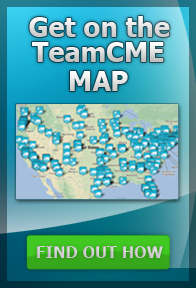 If registering tell Dr. Hebert you will be attending as a “TeamCME” attendee.